ISL Light, a remote desktop app for Android, now offers advanced customisation which allows you to tailor the app to your specifications in order to best serve your business’ needs. By using predefined customisation files you can change graphical elements, command lines and application settings of the ISL Light app. You can live a perfectly delightful remote desktop experience using ISL Light app on your Android phone, without tweaking a single setting. Actually, most ISL Online users use the original ISL Light app for Android. Yet, why not make it your own? ISL Online offers two types of customisation: dynamic customisation and a custom ISL Light for Android APK. 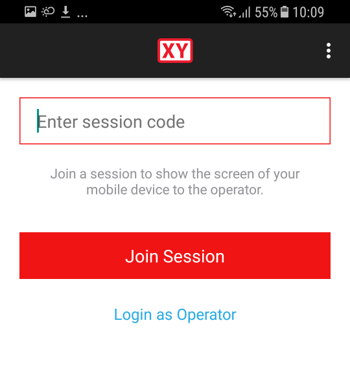 Dynamic customisation is applied when a user logs into the ISL Light app and is intended for users, who primarily use ISL Light for Android as operators or to support a smaller group of Android mobile devices. What dynamic customisation allows is changing ISL Online’s branding images, brand colours, command line arguments (e.g. you can hide the Sign-Up link) and texts in the application. Since customisation settings for ISL Light Desktop and ISL Online Mobile applications are unified, the modifications are applied on mobile platforms as well as in the ISL Light desktop application. An example of dynamic customisation. You can change branding elements and texts. The customisation will be applied only after you first log into the ISL Light app for Android. Server License users can make changes on their own by following this manual (scroll down to Advanced Customisation – Unified Approach), where the process is explained in details with screenshots, while Hosted Service users can only change a company logo or contact ISL Online support for more complex customisation. A custom ISL Light for Android APK is a completely different, more thorough approach. 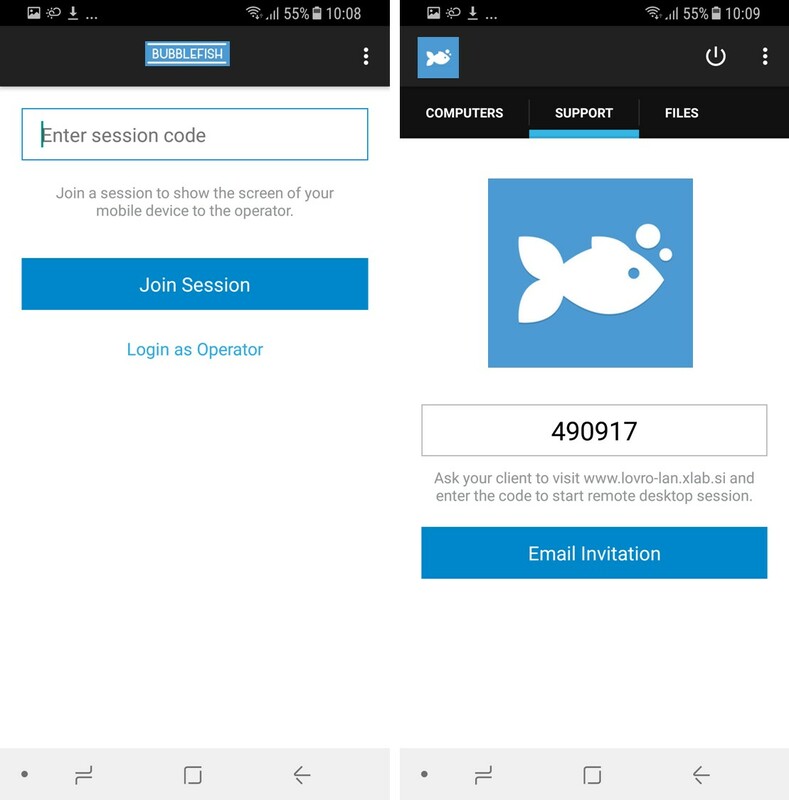 This type of customisation is especially recommended for bigger companies, Corporate Server License users, which need to install ISL Light app for Android on a large number of devices to later connect and offer efficient mobile device support. In this case ISL Online prepares a custom ISL Light for Android APK with a unique application ID which means it can, in agreement with ISL Online, be published also on Google Play. A custom APK includes all the customisations the dynamic approach offers, moreover it allows changing the application icon and application name so the whole experience from the very start is in line with the company’s look and feel. What’s probably the most important customisation option that a custom APK offers, looking from the technical point of view, is the possibility to completely customise the default application settings. That means the original server settings can be modified to your company server, network specifications can be edited, any language can be set as a default one and more. Your clients will be presented with the customised “Join Session” screen. A custom APK changes the application name and icon. The custom application has its own ID so it can be installed beside the original ISL Light app for Android. The custom application will be listed among the Apps with the custom name and icon. Apart from graphical elements you can change the texts, e.g. the predefined text in the email invitation. Original server settings can be modified to your company server, network specifications can be edited, any language can be set as a default one and more. With the dynamic customisation, a user installs the original ISL Light app on their Android mobile device. To apply the changes preset on their ISL Conference Proxy they need to type in the right server address and log in. The app will remain customised until a user signs in with a different account. Clients that download ISL Light only to join a remote desktop session, will always get the original non-customised ISL Light app as they are not prompted to sign in. A custom ISL Light APK is a separate application with its own application ID. A user deploys this APK to any number of mobile devices. The application has specific server settings and the graphical and text customisations are visible from the start, including the application icon. ISL Online’s remote desktop app for Android lets you securely access Android phones and tablets and fully control any Samsung device running on Android 4.2.2 or newer, while it also enables you to support any other Android 5.0+ device through real-time screen sharing and control remote computers from anywhere. This entry was posted in Android, costumisation, Mobile and tagged android, android app, Android customisation, custom ISL Light for Android APK, dynamic customisation, ISL Light for Android, mobile, mobile device support, mobile remote support, screenshots android. Bookmark the permalink.